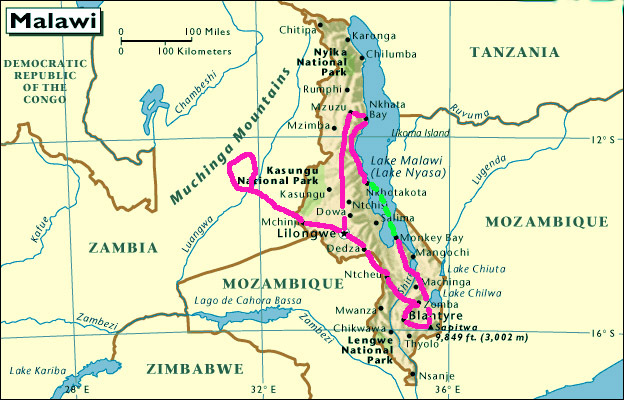 In August and September of 2000 I went on a holiday to Malawi and Zambia. I went on my own and I worked out my schedule while I was there. It was an excellent trip and I never regretted going solo! You can read all about the people I met and the things I encountered in my travelogue. People ask me why I chose Malawi for my holiday. Africa has always been my dream continent although I had never been there yet. As a kid I was fascinated by documentaries on Africa's wildlife (especially lions and cheetas), primitive tribal life, dances and music, etc. I read up on a lot of countries and would love to visit many of them in the future. But reading about Malawi I discovered that it would fit my purposes even better: it's relaltively small, safe, extremely friendly, and there is lots to see and do. It is nicknamed "Africa for beginners" or "the warm heart of Africa". There are various National Parks, mountainous hiking areas, a huge lake (about 500km long) with lots of water sports like kayaking, diving, snorkling, sailing etc. All over the country there are some interesting museums which feature items from David Livingstone and other early missionaries, and all kinds of other cultural objects and information on flora and fauna. What I loved most about Malawi was to see the way the local people live, it just gives you a whole new perspective of your own life and your own country. Click here for my Malawi & Zambia travelogue.